The normal adult spleen weighs up to 150 g, measures 4 × 7 × 11 cm, and represents the largest single accumulation of lymphoid tissue in the body. The spleen lies beneath the left hemidiaphragm and is attached to the stomach, left kidney, and diaphragm by the gastrosplenic, lienorenal, and phrenolienal ligaments. The gastrosplenic ligament contains the short gastric vessels, which can easily be injured during interventions in the area. Anomalies of the spleen must always be considered, including wandering spleen, polysplenia, asplenia, or accessory spleen. Accessory spleen is the most common of the splenic anomalies (>1% of all patients). Solitary or multiple accessory spleens can be found in the splenic hilum, pancreas, lesser sac, retroperitoneum, liver, or gut mesentery. This patient has splenic abscess due to pneumococcal bacteremia. Note that massively enlarged spleen is readily visible, with minimal retraction in left upper quadrant. 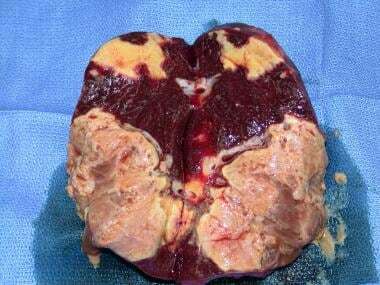 Resected spleen (same as in above image) with abscesses caused by pneumococcal bacteremia. Note discrete abscesses adjacent to normal parenchyma. Splenic abscesses have diverse etiologies. The most common is hematogenous spread originating from an infective focus (most commonly involving aerobes) elsewhere in the body. Infective endocarditis, a condition associated with systemic embolization in 22-50% of cases, has a 10-20% incidence of associated splenic abscess. Other infective sources include typhoid, paratyphoid, malaria, urinary tract infection, pneumonias, osteomyelitis, otitis, mastoiditis, and pelvic infections. Splenic infarct. 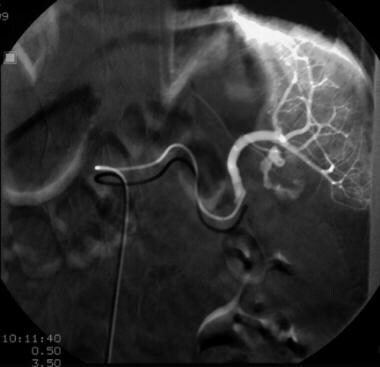 Selective splenic arteriogram showing extravasation of contrast from splenic artery at splenic hilum prior to angioembolization. The natural history of untreated splenic abscess has not been studied prospectively. Data from prospective randomized studies are not available to determine the most effective treatment for splenic abscess. The lack of randomized studies does not provide a conclusive clinical algorithm for the condition. The published literature suggests that early diagnosis, individualized management, and increased experience with minimally invasive methods carry a potential for lower morbidity and mortality. The diversity of the patient population suggests the importance of patient selection to improve outcome. Available results from the use of laparoscopic splenectomy for splenic abscess have been promising, suggesting that there is significant opportunity for further development of this method. Surgical splenectomy must currently be considered the most reliable treatment for this condition and must be considered if the available less-invasive treatment methods fail. In a study aimed at assessing means of predicting outcomes for 114 adult splenic abscess patients in the emergency department (ED), Hung et al comparison of the Mortality in ED Sepsis Score (MEDS), the Modified Early Warning Score (MEWS), the Rapid Emergency Medicine Score (REMS), and the Rapid Acute Physiology Score (RAPS). ​ They found MEDS to be superior to MEWS, REMS, and RAPS for this purpose, with a sensitivity of 92.86%, a specificity of 88.00%, and an accuracy of 88.60%. REID SE, LANG SJ. Abscess of the spleen. Am J Surg. 1954 Dec. 88 (6):912-7. [Medline]. [Full Text]. Chang KC, Chuah SK, Changchien CS, Tsai TL, Lu SN, Chiu YC, et al. Clinical characteristics and prognostic factors of splenic abscess: a review of 67 cases in a single medical center of Taiwan. World J Gastroenterol. 2006 Jan 21. 12 (3):460-4. [Medline]. Westh H, Reines E, Skibsted L. Splenic abscesses: a review of 20 cases. Scand J Infect Dis. 1990. 22 (5):569-73. [Medline]. Lee MC, Lee CM. Splenic Abscess: An Uncommon Entity with Potentially Life-Threatening Evolution. Can J Infect Dis Med Microbiol. 2018. 2018:8610657. [Medline]. [Full Text]. Al-Salem AH, Qaisaruddin S, Al Jam'a A, Al-Kalaf J, El-Bashier AM. Splenic abscess and sickle cell disease. Am J Hematol. 1998 Jun. 58 (2):100-4. [Medline]. Smyrniotis V, Kehagias D, Voros D, Fotopoulos A, Lambrou A, Kostopanagiotou G, et al. Splenic abscess. An old disease with new interest. Dig Surg. 2000. 17 (4):354-7. [Medline]. Schäberle W, Eisele R. [Percutaneous ultrasound controlled drainage of large splenic abscesses]. Chirurg. 1997 Jul. 68 (7):744-8. [Medline]. Völk M, Strotzer M. [Diagnostic imaging of splenic disease]. Radiologe. 2006 Mar. 46 (3):229-43; quiz 244. [Medline]. Iñiguez A, Butte JM, Zuñiga JM, Torres J, Llanos O. [Splenic abscesses. Report of seven cases]. Rev Med Chil. 2008 Jan. 136 (1):38-43. [Medline]. 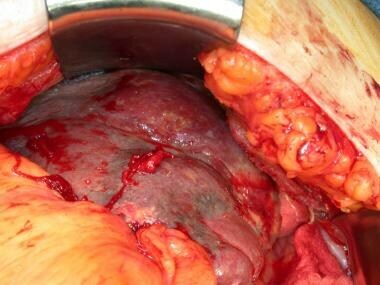 Fotiadis C, Lavranos G, Patapis P, Karatzas G. Abscesses of the spleen: report of three cases. World J Gastroenterol. 2008 May 21. 14 (19):3088-91. [Medline]. Bayer AS, Bolger AF, Taubert KA, Wilson W, Steckelberg J, Karchmer AW, et al. Diagnosis and management of infective endocarditis and its complications. Circulation. 1998 Dec 22-29. 98 (25):2936-48. [Medline]. [Full Text]. Pangonis S, Patamasucon P, Fitzpatrick E. Pneumococcal Sepsis Complicated by Splenic Abscesses and Purpura Fulminans in a 15-Month-Old Child: Case Report and Review of the Literature. J Investig Med High Impact Case Rep. 2016 Jan-Mar. 4 (1):2324709616636398. [Medline]. Albanopoulos K, Archontovassilis F, Alexakis N, Pantelidaki A, Bramis C, Leandros E. Splenic abscess in a patient with Wegener's granulomatosis treated with laparoscopic splenectomy. Mt Sinai J Med. 2006 Nov. 73 (7):1045-8. [Medline]. Lee CH, Leu HS, Hu TH, Liu JW. Splenic abscess in southern Taiwan. J Microbiol Immunol Infect. 2004 Feb. 37 (1):39-44. [Medline]. Tung CC, Chen FC, Lo CJ. Splenic abscess: an easily overlooked disease?. Am Surg. 2006 Apr. 72 (4):322-5. [Medline]. Ulhaci N, Meteoğlu I, Kacar F, Ozbaş S. Abscess of the spleen. Pathol Oncol Res. 2004. 10 (4):234-6. [Medline]. Villamil-Cajoto I, Lado FL, Van den Eynde-Collado A, Díaz-Peromingo JA. [Splenic abscess: presentation of nine cases]. Rev Chilena Infectol. 2006 Jun. 23 (2):150-4. [Medline]. Al-Salem AH. Splenic complications of sickle cell anemia and the role of splenectomy. ISRN Hematol. 2011. 2011:864257. [Medline]. [Full Text]. Yilmaz M, Arslan F, Başkan O, Mert A. Splenic abscess due to brucellosis: a case report and a review of the literature. Int J Infect Dis. 2014 Mar. 20:68-70. [Medline]. Aslam A, Ahmed Shatla ES, Imanullah S, Bedair EM. Splenic Abscess: A Rare Complication of the UVC in Newborn. Case Rep Pediatr. 2014. 2014:903421. [Medline]. [Full Text]. Chong VH, Abdullah MS, Sangkarakumar S, Mathew VV, Telisinghe PU. Chronic Splenic Abscess as the First Manifestation of Pancreatic Tail Tumor. Indian J Surg. 2015 Dec. 77 (Suppl 3):1504-5. [Medline]. Schiavo L, Scalera G, De Sena G, Ciorra FR, Pagliano P, Barbarisi A. Nonsurgical management of multiple splenic abscesses in an obese patient that underwent laparoscopic sleeve gastrectomy: case report and review of literature. Clin Case Rep. 2015 Oct. 3 (10):870-4. [Medline]. Nassour F, Schoucair NM, Tranchart H, Maitre S, Dagher I. Delayed Intra Splenic Abscess: a Specific Complication Following Laparoscopic Sleeve Gastrectomy. Obes Surg. 2018 Feb. 28 (2):589-593. [Medline]. Davido B, Dinh A, Rouveix E, Crenn P, Hanslik T, Salomon J. [Splenic abscesses: From diagnosis to therapy]. Rev Med Interne. 2017 Sep. 38 (9):614-618. [Medline]. Moll R, Sailer M, Reith HB, Schindler G. CT-gesteuerte Drainagenbehandlung der Milz bei Abscessen und Hamatomen. Klinikarzt. 2004 Jun. 33:183-8. Carbonell AM, Kercher KW, Matthews BD, Joels CS, Sing RF, Heniford BT. Laparoscopic splenectomy for splenic abscess. Surg Laparosc Endosc Percutan Tech. 2004 Oct. 14 (5):289-91. [Medline]. Hung SK, Ng CJ, Kuo CF, Goh ZNL, Huang LH, Li CH, et al. Comparison of the Mortality in Emergency Department Sepsis Score, Modified Early Warning Score, Rapid Emergency Medicine Score and Rapid Acute Physiology Score for predicting the outcomes of adult splenic abscess patients in the emergency department. PLoS One. 2017. 12 (11):e0187495. [Medline]. [Full Text]. Liang JT, Lee PH, Wang SM, Chang KJ. Splenic abscess: a diagnostic pitfall in the ED. Am J Emerg Med. 1995 May. 13 (3):337-43. [Medline]. Alvi AR, Kulsoom S, Shamsi G. Splenic abscess: outcome and prognostic factors. J Coll Physicians Surg Pak. 2008 Dec. 18 (12):740-3. [Medline]. Klimpel V. [Does Kehr's sign derive from Hans Kehr? A critical commentary on its documentation?]. Chirurg. 2004 Jan. 75 (1):80-3. [Medline]. Handa U, Tiwari A, Singhal N, Mohan H, Kaur R. Utility of ultrasound-guided fine-needle aspiration in splenic lesions. Diagn Cytopathol. 2013 Dec. 41 (12):1038-42. [Medline]. Divyashree S, Gupta N. Splenic Abscess in Immunocompetent Patients Managed Primarily without Splenectomy: A Series of 7 Cases. Perm J. 2017. 21:[Medline]. [Full Text]. Faruque AV, Qazi SH, Arshad M, Anwar N. Isolated splenic abscess in children, role of splenic preservation. Pediatr Surg Int. 2013 Aug. 29 (8):787-90. [Medline]. [Full Text]. Legrand F, Lecuit M, Dupont B, Bellaton E, Huerre M, Rohrlich PS, et al. Adjuvant corticosteroid therapy for chronic disseminated candidiasis. Clin Infect Dis. 2008 Mar 1. 46 (5):696-702. [Medline]. Zerem E, Bergsland J. Ultrasound guided percutaneous treatment for splenic abscesses: the significance in treatment of critically ill patients. World J Gastroenterol. 2006 Dec 7. 12 (45):7341-5. [Medline]. Ferraioli G, Brunetti E, Gulizia R, Mariani G, Marone P, Filice C. Management of splenic abscess: report on 16 cases from a single center. Int J Infect Dis. 2009 Jul. 13 (4):524-30. [Medline]. Choudhury S R, Rajiv C, Pitamber S, Akshay S, Dharmendra S. Management of splenic abscess in children by percutaneous drainage. J Pediatr Surg. 2006 Jan. 41 (1):e53-6. [Medline]. Ooi LL, Leong SS. Splenic abscesses from 1987 to 1995. Am J Surg. 1997 Jul. 174 (1):87-93. [Medline]. This material is the result of work supported with resources and facility use at the John D. Dingell Veterans Affairs Medical Center, Detroit, Michigan, and VA Southern Nevada Healthcare System, North Las Vegas, Nevada.